Ready To Hire An Embroiderer? Looking for an embroidery shop? So, you think you’re ready to have some embroidery done. How does it work? Scenario #1-You’ve had a business logo designed, business cards printed, and decals or signs made for your car. Now, you’re ready for company shirts or employee uniforms. Scenario #2-Your sister/co-worker/best friend is having a wedding/baby/birthday, and you need a special gift. You have searched the internet (cough, Pinterest, cough) for styles of monograms or lettering. You choose one and download it to your phone. It can be overwhelming when you find an embroidery shop to do your project. SO MANY QUESTIONS! Well, here’s a handy guide for what to expect when you’re looking to have something embroidered. The number of items you have matters to your embroiderer. It helps us to know how long your project will take and where to place you on the schedule. Sometimes, a rush order can be negotiated for an extra charge. Cuz, y’know, we haven’t been standing around waiting for you. Other customers found us first. What Is Your Item To Be Embroidered? Company uniforms? Christmas stocking? Baby blanket? Wedding gift? Embroidering some items can be a challenge. Putting a logo on company uniforms is quite different than embroidering a set of towels. We prefer to take a look at what you would like to have embroidered. If the placement or size of what you want can’t happen, we like to offer suggestions for alternate placement or a different method. Sometimes, a patch can be made or heat transfer vinyl can be used. Most company logos measure 3-1/2” wide. This size will look good on most uniforms. It’s easily readable at a handshake distance. A monogram, on a shirt or jacket, can be done in a smaller size, anywhere from 2” to 3” high. The size of a logo or a monogram depends on the image you want to project. Larger sizes can seem as if you’re shouting. Smaller sizes can be too subtle, like you’re whispering. Most company logos are set up to match business cards or signage. This is usually not an issue, as we have a rainbow of thread in stock. If we don’t have your color on hand, we can take a look at a thread chart and order thread to match. Please understand that this will extend the turn-around time. For individual items, have a color in mind. Blue is not necessarily just blue. Currently, we have approximately 12 different shades of blue in inventory. They range from Midnight Navy to Sky Blue. The same goes for green. So many shades of green! So, there you go. 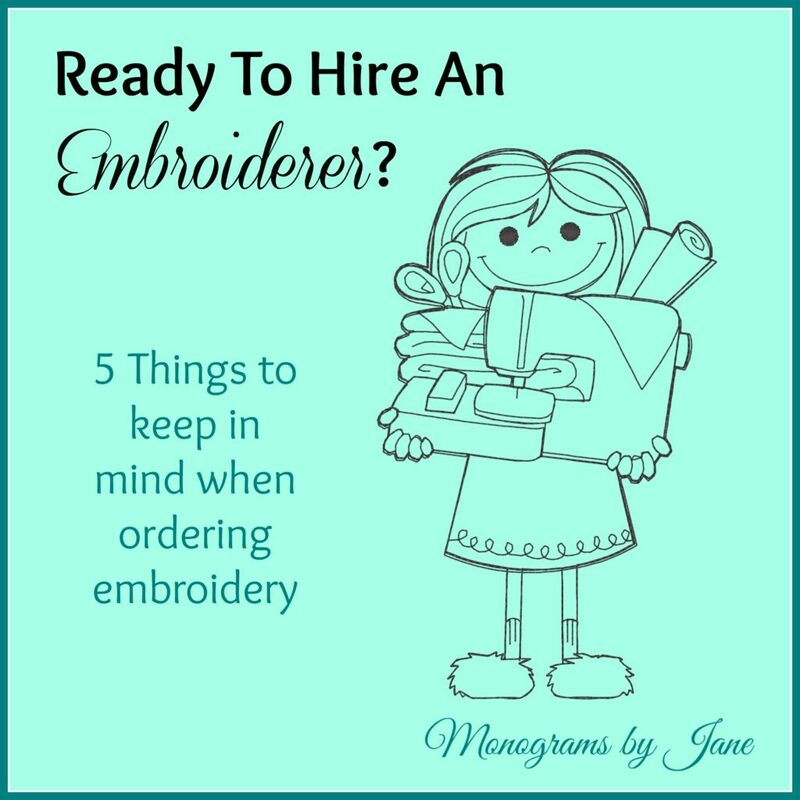 If you have the answers to most of these questions, hiring an embroiderer will be less stressful and time-consuming. Also, be open to suggestions. Remember, embroiderers do this all the time. We have usually embroidered LOTS of different items and know what methods or styles of lettering will work better than others. If you still have questions, give us a call at 719-591-6151 or send an email to info@monogramsbyjane.com. We are always willing to answer any of your questions. Check out our catalog. You'll be amazed at the selection! We’re a “think outside the big box” embroidery shop. Our favorite thing about this business is showing you different styles of lettering, different colors, placement and ALL the possibilities for embroidery, vinyl or patches.